It didn’t really take much time for the VIRGIN STEELE band to realize, and I am guessing here guys so please don’t shoot shotgun, what needs to be done in order for the sophomore record to sound grand. 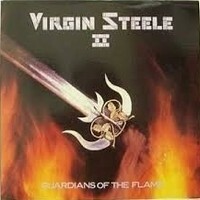 “Guardians Of The Flame”, originally released in 1984, also to be featured as the future band name of guitarist Jack Starr, displayed VIRGIN STEELE at some of their golden moments, but also signed of an end of an era with Starr’s departure post release of the album. While gradually closing in on the musical style that will be their core for the road ahead, VIRGIN STEELE circled, in their being all around kind of songwriting, the borders of AOR and Hard Rock, yet without the Blues driven material as portrayed on the debut. Generally, it made “Guardians Of The Flame” to be a rather diverse record, like a bellyful of early 80s Heavy Metal that didn’t put aside some of its roots, quality epic tunes to the side of commercial hits. Without a doubt, with its attributes, leaving dust to the debut. David DeFeis vocal abilities improved tremendously, putting his high caliber voice to work, contributing to the might of the tunes and not merely shouting his throat off. In a way I found his performance to be similar to a mix of Bruce Dickinson (IRON MAIDEN) and Brian Ross (SATAN / BLITZKRIEG). Jack Starr’s riffs might be ordinary for what is to be expected, and his soloing isn’t a powerful shredding tool, but who needs more really? What you are listening out of this guy is pure class a wholesome of energy. The self-titled tune “Guardians Of The Flame” was the first to capture my notice. An epic Metal tune, has that JUDAS PRIEST spirit in the main riff up until it starts to blaze with a victorious chorus. It is more than the basic form of a song, and it has quite an interesting instrumental part, including Starr’s heartbreaking soloing and DeFeis Keyboards virtuosity. One of VIRGIN STEELE’s strongest tracks to date. Straight up Heavy Metal comes burning bright with the howling shout of DeFeis, welcoming “Burn The Sun”. Not leaving any doubt that the band is in an attack form. Sounded to me like early SATAN tunes, but American bred. Treading in the fields of British Metal, the catchy “Hell Or High Water” is a center attention. Simple and basic but just what the doctor ordered for a vintage Metal fan. One just can’t end an 80s album without a sweet balladry, or at least a soft tune in the version of VIRGIN STEELE, that’s what you get with the impressive work made in “A Cry In The Night”. Keeping the vibe on the AOR / Hard Rock vein, opener “Don't Say Goodbye (Tonight)” is surely one of the band’s catchiest songs, its light, keyboards driven and with amazing vocal performance. One of its followers, “Life Of Crime”, actually reminded me of TKO for some reason, charging with a tough riffing and blazing lead guitar shrieks, another number to be reckoned with. When it comes to bonuses, No Remorse Records truly reached bingo with the tracks of the “Wait For The Night” EP, a little later after the album’s release. Other than the opener, which is already featured, I really enjoyed the Heavy Metal chugger “Go Down Fighting”, a true street fighting tune that is US Metal. “Wait For The Night” as the Hard Rockin’ thriller killer, a true produce of the Hard N’ Heavy of the 80s, crispy, catchy and to the point. As far as the other bonuses, similar to the debut offerings, it felt to me as mere fillers just to lengthen the reissue. It could easily have ended with the “Wait For The Night” EP and that’s it. Though the live “Great Sword Of Flame” and “Rising Unchained” are great and all, but really, who needs the demos or a spoken word track? Packaged nicely with a 24 page booklet, along with linear notes of DeFeis of his experience of the era of the album, “Guardians Of The Flame” in overall is a must for every Metalhead that respects the roots of what we are listening to today.